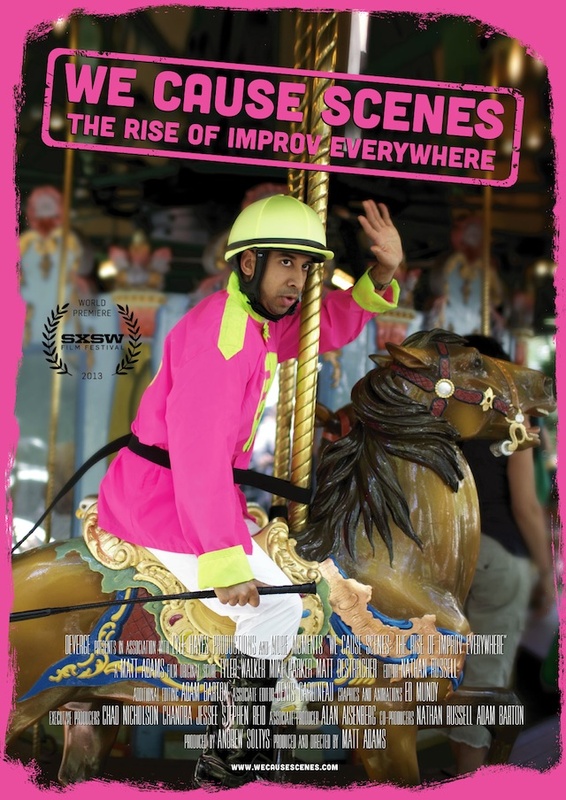 We Cause Scenes is a feature length documentary directed by Matt Adams about Improv Everywhere. The film which tells the story of its founder Charlie Todd and how he started the prank collective after being an unemployed New York actor who was frustrated by the lack of opportunities. We first wrote about the documentary project in 2011. The film’s world premiere happens Friday March 8, 2013 at 7 PM at SXSW. Improv Everywhere is staging an Mp3 Experiment project in Austin the weekend of the premiere (RSVP). …Charlie began using the city as his stage, causing scenes in parks, bars, and subways, documenting these unauthorized performances online under the name Improv Everywhere. A prank collective ten years in the making, Improv Everywhere has grown from a few close-knit 22-year-olds staging guerrilla pranks on the streets to a global phenomenon incorporating hundreds of thousands of strangers. From the “No Pants Subway Ride” to the “Grand Central Freeze”, Improv Everywhere’s public scenes of chaos and joy have inspired pranksters all around the world.